I hope you have had a good day, me I have been painting like a man possessed, today I created this. It is my response to investigating the colours, patterns and compositions in Matisse’s work. 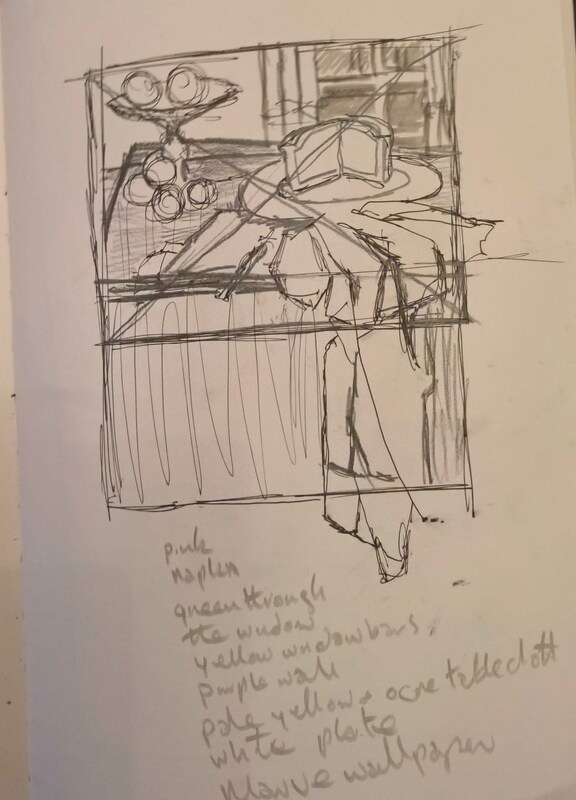 The initial inspiration was a sketch by Matisse “Study for a still life after de Heen”. 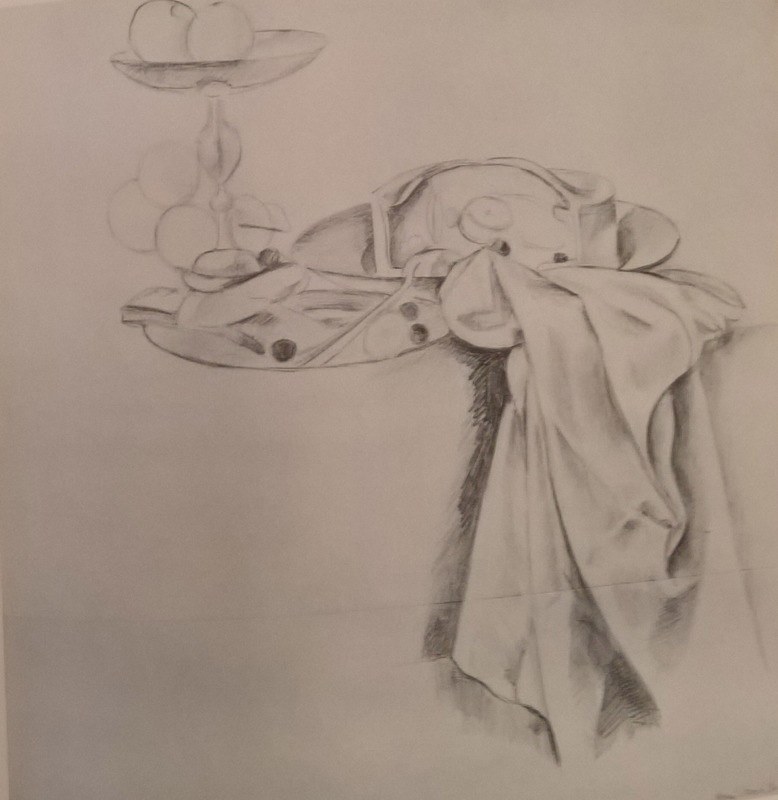 Matisse’s inspiration seems to be “A table of deserts” by Jan Davidsz de Heen a seventeenth century Dutch still life painter. What do I like about the finished painting? I like that it has a Fauvist feel and it seems to fit with early twentieth century art, it was much easier to carry the pattern and devote time and attention to the edges of the painting because Matisse is more aware of the three dimensionality of the subject whereas Blackadder works in a more two dimensional way. This method of working means that there are more cropped edges at the boundaries of the canvas which encourages you to pay more attention to where the edges meet the boundaries of the canvas lessening the background effect. 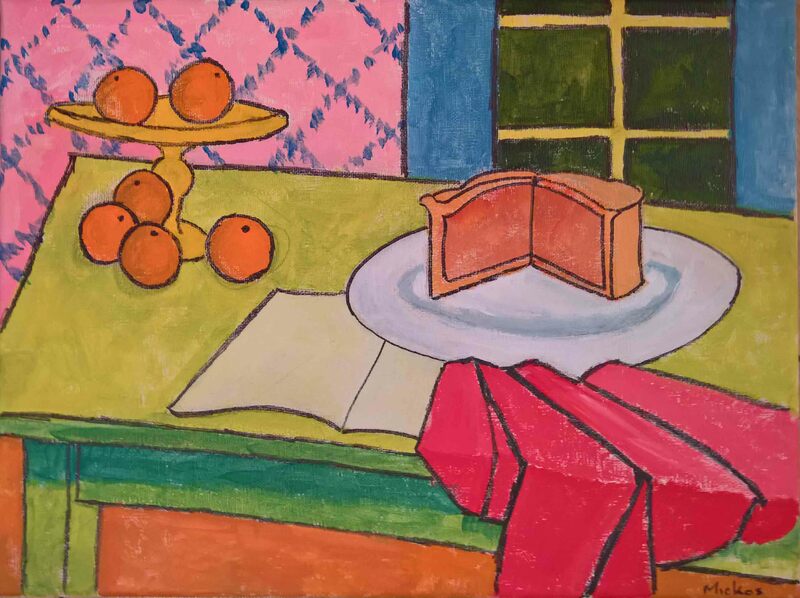 The red Napkin acts as the lead in taking the eye away from the right hand edge of the picture frame towards the oranges with a minor focal point of the pie on the way through. Apart from the lead in, the right edge of the canvas is blank encouraging the eye to stay in the picture. Whilst I am pleased with the flatness of the final image I think it somehow achieves the Cezanne fall from back to front. What don’t I like? 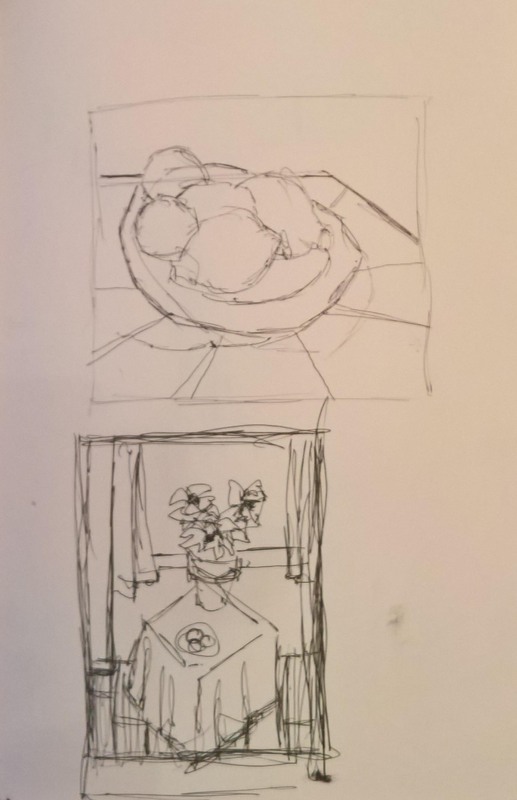 The finish is not rough enough to compare to a Matisse, this is probably due to not having seen enough Matisse’s in real life as opposed to on the internet and probably compounded by using the sharpie to introduce the outlining rather than the brush. I hope you enjoyed our investigation into Matisse and that it makes more sense to you now following my research.